Japan is a surprisingly mountainous country. With all the major population centers shoved together along the coastal lowlands, the interior is blissfully empty. After all the hassles and headaches of navigating between Osaka and Tokyo (with a population of around 12 million in the metropolitan area) we were ready for some serenity. Even if it meant more lung-bursting climbs. We decided riding the spine of Japan was our best option. Anything, we reasoned, would be better than fighting our way through a tangle of super highways. We made the right decision. 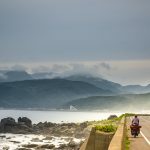 Just two days out of Tokyo, the landscape unfolded into a procession of rugged mountains, deep valleys and rushing rivers (just as the guidebook promised!) And rain. Lots and lots of rain. 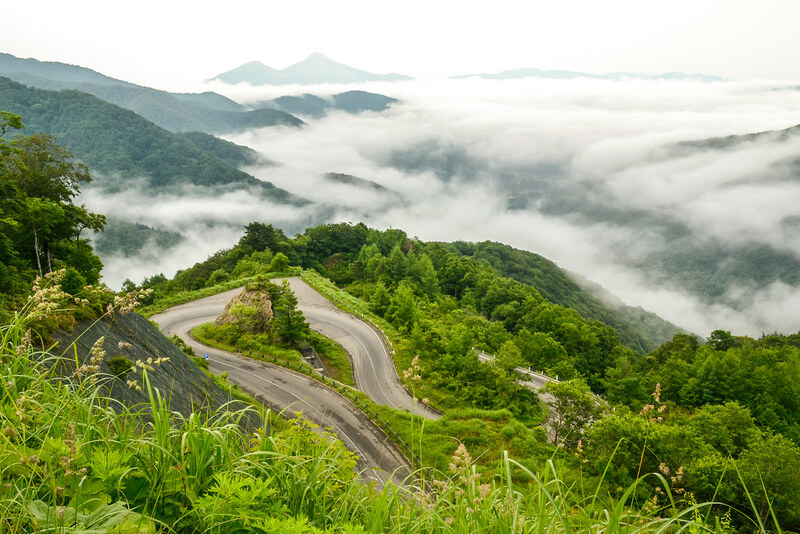 The switchback climb up to nearly 1,400 meters in Bandai-Asahi National Park. We were lucky in that the rain let up and the clouds cleared so we could momentarily enjoy the fruits of our intense efforts. I can’t say it’s been easy. Daily drenchings tend to dampen morale. Those ancient Edo temples and shrines are more difficult to appreciate when you’re getting doused by yet another tropical storm. But we’ve been lucky. On four occasions kind Japanese families have invited us into their homes. This is highly unusual, I’m told. The Japanese are intensely private people and even close friends are rarely invited into the family home. I’m deeply grateful for these experiences. In a few months time the memory of the miserable rain showers will have faded. But years from now, I’ll still remember Sammy, the retiree we surprised in his garden and who ended up inviting us to spend the night in his home. Take, the public servant and surfing nut who packed us up in his car and drove 40 kilometers so we could take shelter at his home. 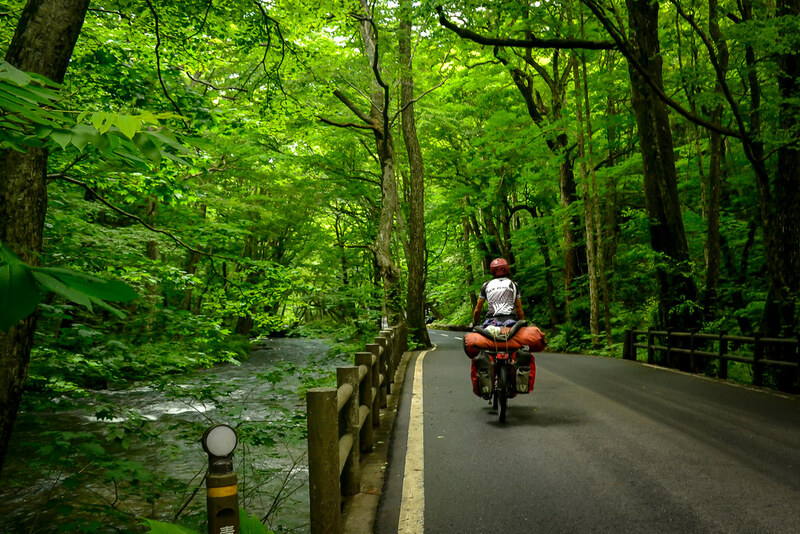 Yuomi, the young women cycling home from work who invited us to her beautiful home in a small village near Nikko. And then there was a man whose name I will never know. He spoke not a word of English but signed to us that rain was in the forecast. He opened up his small country home, got us settled in and then drove off into the night. The kindness of these individuals is what I’ll remember most about Japan. This was a beautiful alternative route to the main highway (which you can see across the lake). We passed hardly a single car and avoided the scary tunnel on the main road. Navigating has been much, much easier north of Tokyo. Shinkyo Bridge stands guard to the shrines and temples at Nikko. 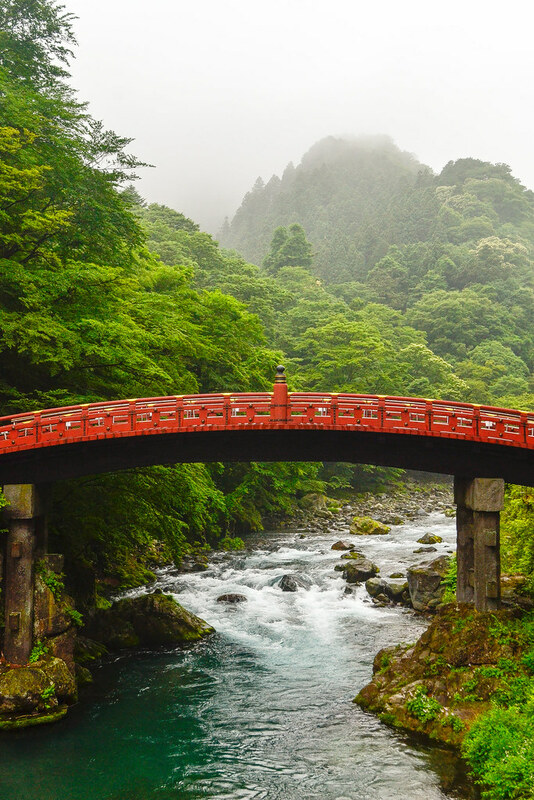 This in one of Japan’s best known bridges and was constructed in 1636. 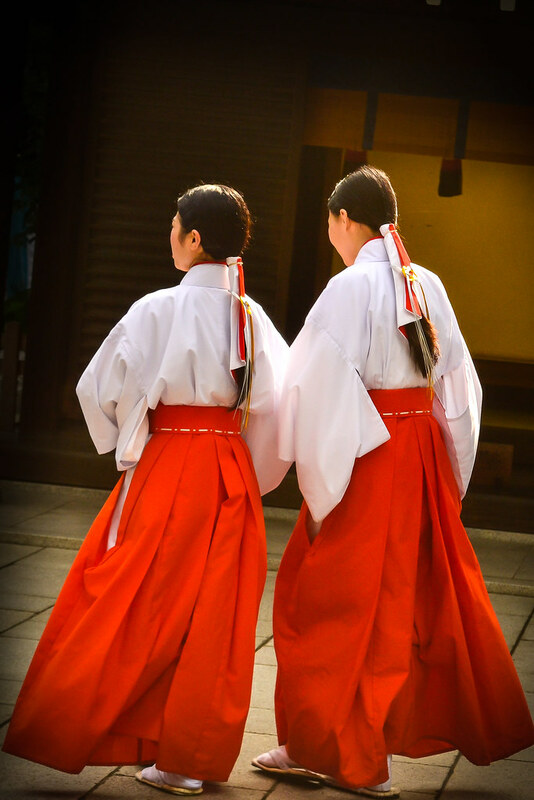 Young women in traditional attire prepare for a temple ceremony. 68% of Japan is covered in forest. Outside urban areas the riding can be spectacular. This shot is a beautiful road leading up to the temples and shrines of Nikko. Finding cover from the rain is always high on our list of priorities. 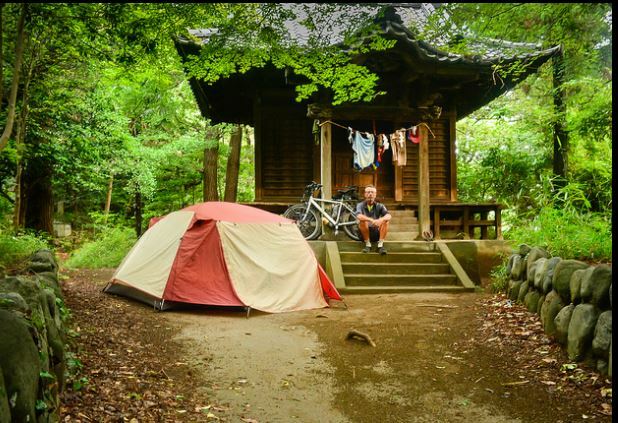 We’ve been lucky most nights–this was a spot in Kurikoma National Park. 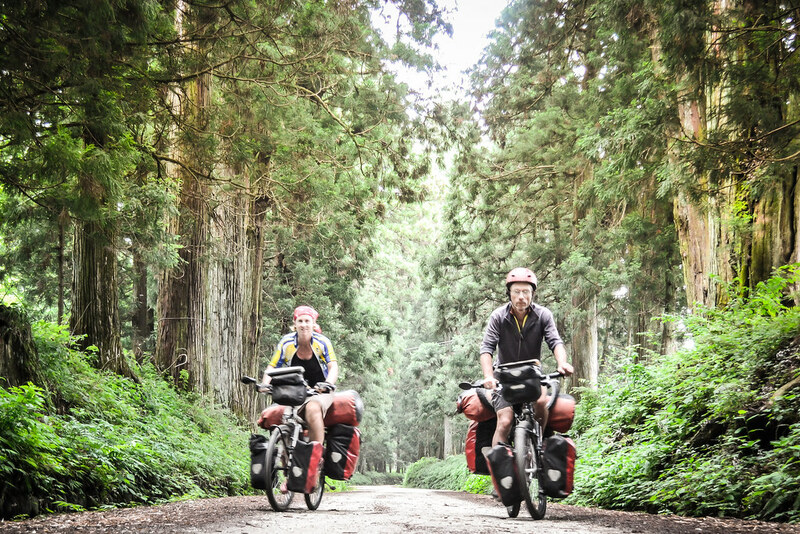 One of our favorite parts of the Japan tour has been the ride through Towada-Hachimantai National Park on the very tip of the big island of Honshu. It probably helped that it was our first day of sunshine in more than a week. Winding our way through the tropical foliage of northern Honshu. Today we hop on the ferry to Hokkaido. 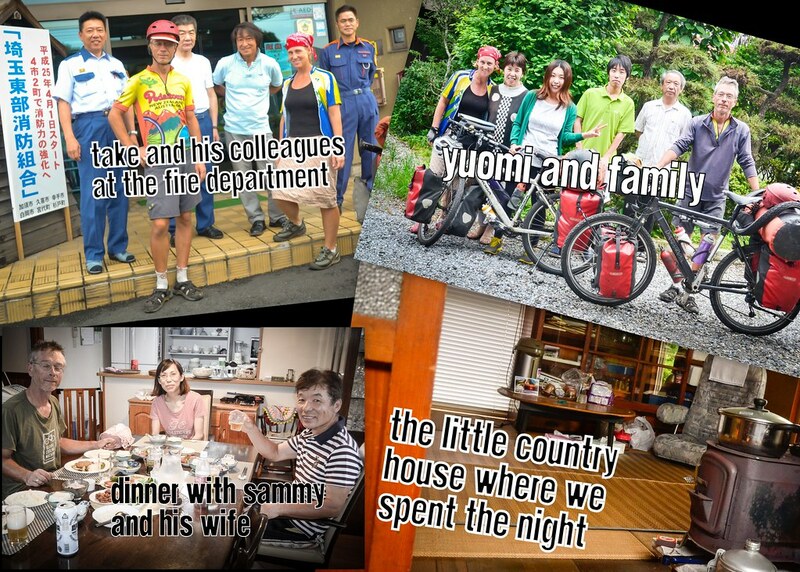 Just a few of the many strangers who have made us feel at home in Japan. Fantastic! Definitely have Japan on my list of places to tour now. Stunning photography. Very inspiring! You make me want to get our there and ride my bike. 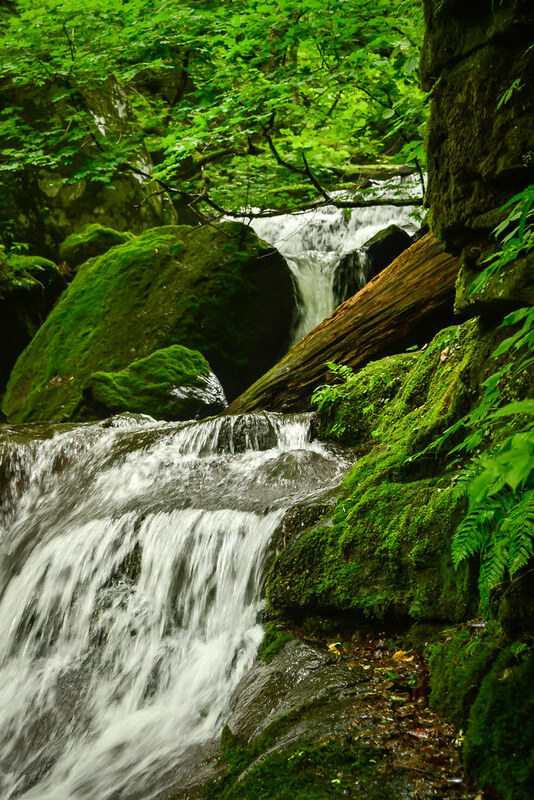 Yes, there are some beautiful spots in Japan–lots of National Parks to explore. What months were you biking? 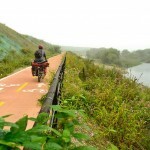 I’ve been playing with ideas for a Japan bike tour headed south from Tokyo as late fall trip works best for my timing. 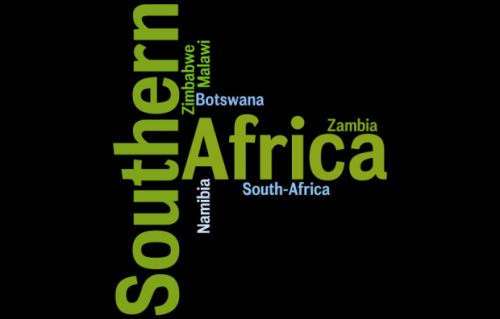 Looking at your pictures and reading descriptions, I now want to go north and inland! We’ve been here in Japan in June and July. Late fall should be spectacular for the changing seasons, though Hokkaido could be getting chilly. You’d probably be fine up there until mid October with a good sleeping bag and the right gear. Amaya,the photo titled “winding our way through the tropical foliage” was that Oirase? in Towada ,Hachimantai area. Yes, Paul, I believe that’s right–one of the loveliest parts of Japan.